On June 1 of this year, MSNBC host Keith Olbermann devoted most of his hour of Countdown to his withering outrage at the shooting of late-term abortionist George Tiller in Kansas (and how it was caused by Fox News). The tone was dramatically different than his tone on November 5, the night of the Islamic terrorist shooting rampage at Fort Hood in Texas. Here’s Olbermann’s very dry opening: "Nightmare at Fort Hood: How could a soldier kill at least 12 other soldiers and wounded at least 31 more? And why?" Domestic terrorism: Dr. George Tiller -- women’s health physician, performer of legal abortions -- is assassinated in his church. 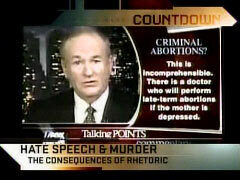 And in the very same sentence, anti-choice zealots wash their hands of his murder and say he had it coming. A religious jihad by fundamentalist crusaders who believe that murder is justified, their acts of violence having the intended effect of changing behavior. Our fifth story on the Countdown: Not the Taliban, not Hamas, not al Qaeda. If the brutal murder of Dr. George Tiller -- the Wichita OB/GYN who, among many other things, provided abortions -- does not qualify as an act domestic terrorism, what does? An elected Republican official today is leading a protest on the west steps of the Capitol that compared health care reform to Nazi death camps and encouraged mindless harassment of and possibly violence against the government. Not tea baggers anymore, not demagogic commentators, an actual congresswoman inciting a hateful rebellion against the rule of law and order. Her name is Michele Bachmann. In other words, he had more outrage for the alleged violence against the government that may some day be spurred by the rhetoric of Bachmann than the actual violence committed on federal property by Major Hasan. OLBERMANN: When you consider how something like this must end, no matter what the motive was, no matter what the premise of it was, wherever he might have thought was rational as he did it -- what leads a person, and I guess this the ultimate question in these scenarios, to take out other people`s lives and other people's lives to cause such pain among -- basically people who have nothing to do with him. These are not direct victims, we assume. Rather than, why do it that way when rather than just cut to the chase and if you say, "I can`t bear to go and I'm going to end my own life," why not do that first, in other words. I know it`s crass-sounding, but why is that choice made to involve others? VAN ZANDT: I think one of his alleged Internet postings gives us a clue to that, Keith, where he suggests that a suicide bombing, in essence, the killing of innocents is the equivalent of throwing yourself on a grenade to save others. In his mind. VAN ZANDT: In his challenged mind, that mass murder may have been somehow saving the lives of Muslims in the Middle East. OLBERMANN: And there -- is there an expectation that at some point, his goals and his personal goals got merged with some anti-American point of view? Is this going to wind up being classified as a terrorist act? What do you think about that aspect that so many people want to know about? VAN ZANDT: Yes. We all -- we always want to know motive. VAN ZANDT: A jury always wants to know the motive, why someone did something. And most of us, Keith, were relatively complex creatures. We have multiple motives. So, even though this is a man who told no relative of his that he was going to be deployed, he was so angry, he was so upset, there may have been something else -- something in his Internet communications, something in his religion, in his politics, that gave him a secondary motive for doing what he did. That`s the job of investigators. VAN ZANDT: As they go through his Internet, they go you through his mail, they try to understand what terrible trip this man took inside of his mind that led him to take the lives of others, whereas a medical doctor, he swore that he would save lives, not take them. OLBERMANN: Clint Van Zandt, former profiler with the FBI --- great thanks to you for helping us begin to understand what happened today. Olbermann also saved his "Worst Person in the World" awards for Rush Limbaugh (Worser) and Rupert Murdoch (Worst). Bizarrely, there was no room in that contest for the mass murderer of 13 Americans. That's Countdown for this the 2,380th day since the previous president declared "Mission Accomplished" in Iraq. I'm Keith Olbermann. See you tomorrow night, I hope, with analysis of the self-destruction of Carrie Prejean. Until then, good night and good luck.